The founder of Silicon Valley-based venture capitalist firm 500 Startups has resigned following sexual harassment claims by several women. 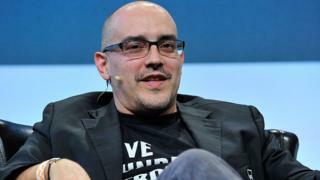 Dave McClure announced his resignation in a blog entitled: "I'm a creep. I'm sorry." Entrepreneur Sarah Kunst had claimed in the New York Times that Mr McClure sent inappropriate messages after discussing a potential job offer with her. Mr McClure apologised directly to her for his behaviour in his post. He also admitted that he had behaved inappropriately towards other women. "I made advances towards multiple women in work-related situations, where it was clearly inappropriate," wrote Mr McClure. "I put people in compromising and inappropriate situations, and I selfishly took advantage of those situations where I should have known better. My behaviour was inexcusable and wrong." After the article, tech entrepreneur Cheryl Yeoh also published claims of an assault in her apartment and claimed there were "dozens" of women who had been sexually harassed by him. She said she had hosted Mr McClure and some other investors at her home to brainstorm new ideas in 2014. He was the last to leave. "He pushed himself on to me to the point where I was backed into a corner, made contact to kiss me, and said something along the lines of, 'Just one night, please just this one time,'" she wrote. Ms Yeoh said she had already told Mr McClure that she had a boyfriend, and that he knew him. "The fact that I had to say no multiple times, and that he had pushed himself on to me and kissed me without my consent was way more than crossing the line of inappropriateness," she wrote. In his blog Mr McClure apologised directly to Sarah Kunst and "the women I have hurt or offended" but did not mention Ms Yeoh by name. He has not commented on her claims. TechCrunch reported that a female partner in the firm had also resigned, criticising 500 Startup's leadership for its "lack of transparency" regarding Dave McClure. Co-founder Christine Tsai has now taken on the role of chief executive. "As much as we want to be part of the solution, we clearly have also been part of the problem," she wrote. "Undoubtedly there are ways I could have done more or acted sooner." Dave McClure is undergoing counselling "to work on changing his perspectives", she added. Silicon Valley has been rocked by sexism scandals in recent months. Several senior executives at Uber, including founder Travis Kalanick, resigned after a damning report into the organisational culture within the firm which included sexual discrimination. Last month, Binary Capital co-founders Justin Caldbeck and Jonathan Teo both resigned from the tech investment firm following accusations of harassment carried out by Mr Caldbeck. In a statement to The Information (which has a paywall) Mr Caldbeck said he was "deeply disturbed" by the allegations. "There's no denying this is an issue in the venture community, and I hate that my behaviour has contributed to it," he said. At last week's Female Founders conference, attendees said they were pleased to see action was being taken. "People are being held accountable - they're not sweeping it under the carpet," Jessica Livingston, co-creator of start-up investment programme Y Combinator, told the BBC.